Tony Davis was inspired by the original classic banded Paperbacks (designed by Edward Young in 1935) from Penguin. He grew up seeing them everywhere and then they disappeared except to collectors. The Penguin Brand and familiar (if subtly altered logo) was still very much evident but book design had moved towards photography and illustration in the 50s and 60s. The original cream and orange banded paperbacks could only now be found in secondhand bookshops. The orange still remained a key part of the Penguin logo. So how to translate a design (from the 1930s onwards) which still had a cognoscenti following amongst typographers and designers but had largely disappeared from public consciousness? The original typography was created by Jan Tschichold. Unless you were 50 or over it is unlikely this style of books would mean anything to you. In fact, one of the first comments on starting the project was by a retailer who said ‘great. people over 50 will really love this…’. Tony Davis’s exciting vision was that the originals (in all their variety) could be ‘translated’ into lifestyle objects which were utilitarian and mass-market, affordable yet without sacrificing quality (like Allen Lane’s original intention for the Paperbacks). In addition, there was the potential to play with language and the relationships of Author and Title with an object. Suggestions anyone for Raymond Chandler’s The Big Sleep…? About Penguin: For more about Penguin look here. This wasn’t a slavish adherence to craft methods. The two things combine: useful and beautiful. Mass production is fine if done ethically and without waste. It was important to ensure that all production methods (even for the simplest objects like a mug) were the right ones. Penguin Mugs – 31 designs. One of the challenges here was to balance the variety of titles with wit, colour, and the nature of the object. This was solved with the Bookbags by making them double-sided allowing for a ‘change of mood’. Flip the bag and the statement of the title is different. See The Lost Girl/Mantrap Bookbag for illustration of this. Mugs could be ‘paired’ in retail to create messages: see Thinking to Some Purpose & Together. Packaging was also important. Initially none of the products were packaged for eco reasons. The Tea-towel tubes (card) were the perfect gift pack. The mugs also had boxes designed with clever details for recycling. Initially select covers were taken from ‘classic’ designs in the Cover archive for use in Print-on-demand. These were printed and framed in partnership with Charles Howell at Fine Digital Print, Wiltshire. 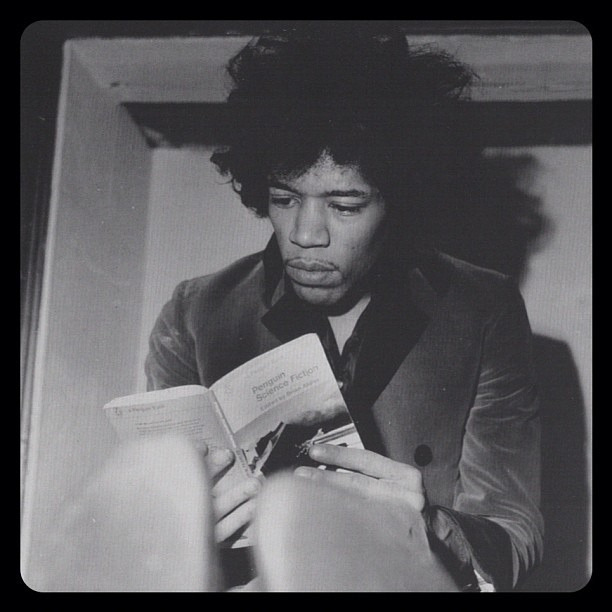 He did a great job of faithfully reproducing the original paperbacks – print quality and all. So much so that someone once demanded an explanation for the letterpress impressions (which they thought were print errors) reproduced in the print. These were produced to order and the most popular covers were: The Big Sleep (Raymond Chandler), and Virginia Woolf’s A Room of One’s Own. Publishers are increasingly challenged to complement their income from books not just from digital sources (e-books etc) but also what’s termed ‘non-book’ product. Therefore in 2012 due to the impact and success of the project and its potential for revenue and the potential for scalability Penguin brought the project in-house to globally distribute the designs and sell directly. Availability: None of the designs are in production by Art Meets Matter now. Originally sold in various retailers all over the world including: Conran Shop London, Conran Shop Paris, British Library, Bertrams, Blackwells, Uppsala Bookshop (Sweden), Arvon Foundation, Camden Lock Books, Borders (UK), The Literary Gift Company, Heffers (Cambridge), Waterstones, Bijlevelt Boekhandel (NL), Papercut (Sweden). Prototypes and Ideas presented which did not progress for financial, technical or brand reasons by Penguin or had very limited production runs include: Tins, Lampshades, Bedding, iPad Covers, Beach Chairs, Kindle Covers, Tables (also for the Puffin Project LINK, and working with the ever brilliant and stylish FurnitureDesigner/Maker Steuart Padwick), Stationery Binders, Teacups, Teapots, Bookshelf, Glasses, USB storage, Messenger bags. Wanda Sowry even made a brilliant one-off automata to celebrate Penguin’s 70th Birthday. The response to the designs was phenomenal for a decade. Everyone sold them. We think almost everyone has them. They have featured in almost every magazine of quality globally. They’ve appeared as props in West End plays. Lifestyle makeovers. Documentaries about design of the Deckchair. Incidental elements in Films (Simon Peg in How to lose Friends and Alienate People adaption of Toby Young’s book, which has Actor Bill Paterson Simon’s Dad in the film washing the mugs in New York) and TV. Elbow created a pastiche for their Seldom Seen Kid Album. Grayson Perry has parodied them (woven Penguin Mugs as in his Vanity of the Small Differences Tapestries at Victoria Miro. Lily Allen has even been chased down the street by the paparazzi carrying her Penguin Mug. 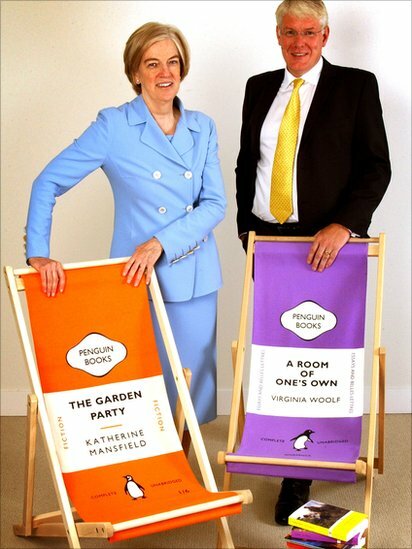 When the BBC did a feature on Penguin Books at 75 seven images summarised the company Pearson’s Marjorie Scardino was shown with one of our Deckchairs (also used for the Financial Times annual report). Below is just a very small selection of the press garnered by the project. Anthony Gormley’s Trafalgar Square Plinth One and Other project saw William from Melrose installed just after midnight with his Big Sleep deckchair and a Penguin Mug. There was even polemic about books being turned into commodities in The Guardian which Tony Davis replied to in article form. Jan Tschichold designed the beautiful Sabon typeface (1967) used in more recent Penguin publishing. Gill Sans was used extensively for the paperback covers after the initial few and the modernism express in the font complemented the new look for publishing.